You may have been asked to complete a social media satisfaction survey. Online of course. Saw my first one a while ago. And I’ve been wondering since then whether social media can offer any satisfaction at all? The HeartMath Institute (www.heartmath.org) studies the benefits of being with people. Take a look a this informative video about heart-mind connections. The film is very inspiring. But it raises a question or two. How can we use social media to make life more fulfilling? And that’s not just for individuals but for families, groups and organizations. Society at large. How can social media have a positive role in our culture? Does it have a role? Could it be that the phrase, ‘social media satisfaction’ is actually a mis-direct. After watching the film it would appear impossible for a human being to gain lasting satisfaction through use of social media. Humans are somehow made to interact and thrive with other humans. And here’s where this gets personal. In that time I’ve heard and seen so much abuse and argument, rudeness, crudeness and all sorts of nastiness. Among friends. What to speak of among people I don’t know. Arguments and quarrel rule supreme. If someone stands for a certain point of view they get slammed. If someone argues, rationally, with grace; they get slammed. If a person states an opinion they are likely to be judged, ridiculed and branded immediately as ‘extreme’. Social media has become a combination of adverts, gossip, nastiness, arguments and dissension. The UK is a nation of shoppers. A nation of online shoppers. Recently read that up to half UK consumers are waiting for ‘Black Friday’ bargains this year. That’s a lot of people waiting to buy a lot of things. Looking for lasting satisfaction in temporary, material objects. So really we, the Internet community, should not get caught by the economic pull of quick profits. But we should be looking for ways to enhance the human experience with real personal interaction. Not superfluous things like social networks. Because they’re not real people. They are software tools created with good intentions. But been ‘bought-up’ to make money from the masses for a few people. Of course there is light among the darkness. Love, truth, wisdom, hope, compassion and transcendent reality can be found in social media too! But all too few people are posting love. So finally it’s come time to get thinking caps on. And time to bid farewell to social media. It’s been interesting. This entry was posted in Communication, Community and tagged community, social media on 15/11/2016 by Pat Tusler. Recently met up with some old friends who are living off-grid in a small community in Pembrokeshire. Friends chatting outside after the opening ceremony. We went on a full moon day, but in the afternoon under a clear blue sky. The whole atmosphere of the place was wonderfully natural, refreshing and clean. 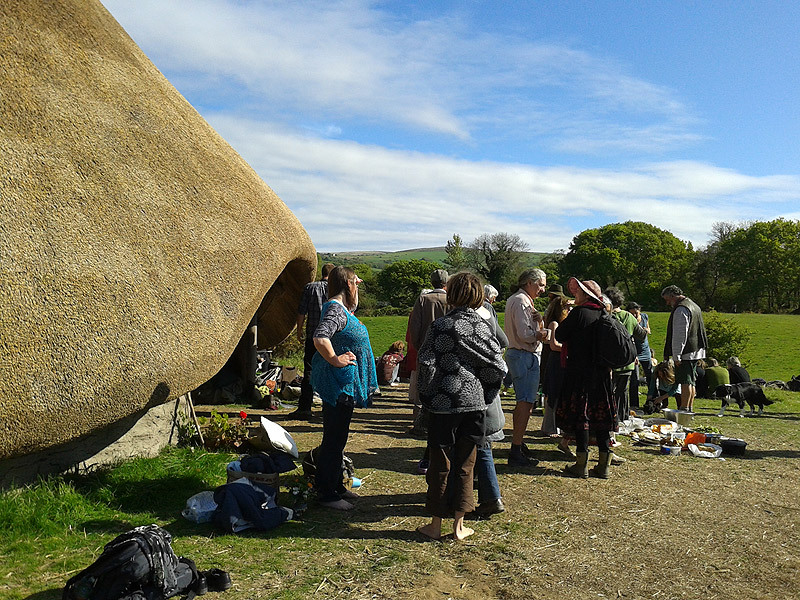 Over the winter our friends had been building a round-house and we were there for the opening ceremony. It was almost over when we got there late but we still felt the warm, welcoming vibes and got to hear some of the singing – ‘we stand tall, we stand tall’ was the refrain. 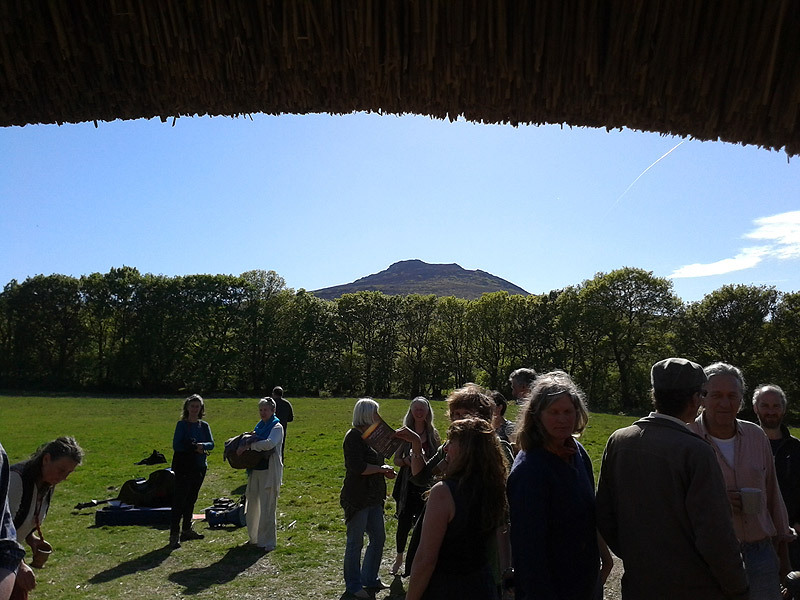 It was a very inspiring and rejuvenating couple of hours spent talking with old and new friends that afternoon beneath Carn Ingli mountain. And we brought back home a sense of having experienced something very precious. Will have to visit again and see what its like in different weather. A few days after our visit I looked on Google to see if there was anything online about the place. Lo and behold they have a web page of their own Tir Ysbrydol (Spirit Land). This entry was posted in Community, Tusler Design, Tusler Design Misc and tagged off grid, unusual on 27/05/2014 by Pat Tusler.